Vaughn Ripley is a professional inspirational speaker who tackles tough subjects and helps lift the spirits of others and builds momentum that leads to inspirational motivation. He does keynote speeches, inspirational life lessons, team building, coaching, and other forms of discussions. Vaughn has appeared at corporate retreats, local community events, hemophilia chapter events, panel discussions, churches, and college events. Each speaking engagement is specifically tailored to the event and anticipated audience. And, Vaughn creates a unique experience with each speech. Vaughn is always open to new ideas and innovative ways to use his story and talents. Please contact VaughnRipley.com for current speaking pricing via the Contact Page. A deposit of 50% of the full speaking fee (not including travel expenses) is required to schedule and confirm the event date. The remaining 50% payment is due within 30 days after the speaking engagement. Travel Expenses will be added to the speaking fee. These expenses include, but may not be limited to, unrestricted round trip coach airfare, ground transportation, and moderate meals. Hotels should be guaranteed for late arrival and billed directly to your organization. Local events that do not require overnight stays will only include vehicle mileage fees and any meals. Non-profit organizations in the bleeding disorder, HIV/AIDS, Hepatitis, or other affiliated communities will receive a discount off of the speaking fee. Please contact VaughnRipley.com for current speaking pricing via the Contact Page. Schools and educational services will receive a discount off of the speaking fee. Please contact VaughnRipley.com for current speaking pricing via the Contact Page. Customers who pay the full speaking fee prior to the event will receive a 5% discount on the price (not including travel). Other discounts are available and negotiable for scheduling multiple events. If the event is cancelled for any reason 15 days or more prior to the agreed date, it’s Vaughn Ripley’s Policy to reschedule (within 12 months) for the same fee. Should you be forced to cancel within 15 days of the event date, the deposit will be kept and rescheduled events will incur the full price. “We invited Vaughn Ripley to be a guest speaker at our 2018 Stago National Service Meeting. Our theme was Commit to Excellence, because every patient matters. We typically focus on very technical trainings and customer service trainings. In addition to those trainings, this year we wanted to remind our service teams that at the end of everything we do to support our immediate customer, the clinical laboratory, there is a patient waiting for test results and this is why we hold our teams to such a high standard. Vaughn was scheduled to close two of our longest days, a tough spot to capture the attention of a tired group of people, but he was excellent. Not only did he grab everyone’s attention but he also held it such that our teams then went on to an extended Q&A session and we then had Vaughn join our teams for dinner so the conversations could continue. To say that he and his story was inspirational does not even begin to express the energy he created among our teams. Our teams left that speaking event knowing why we need to do our best every day and commit to doing excellent work but they also left feeling inspired to do more for not just our customers but themselves as well! His excitement literally lifted people up and gave them courage to do better but also achieve personal goals. “Vaughn was a part of a panel of speakers I carefully hand-selected for Purpose2Play Summit: Talking Triumph, where we had five heroes from the world of sports deliver positive and inspiring messages to both corporate types and to adaptive athletes in Dallas. 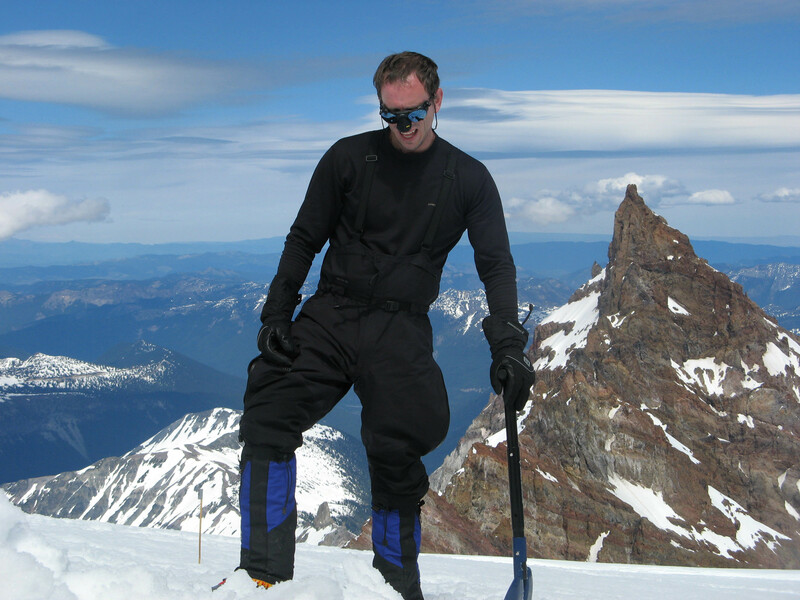 With Vaughn being a marathon finisher, a cyclist, an accomplished mountaineer, and a dedicated health and fitness professional, he successfully encouraged others to live their own best lives with a sense of urgency. His multi-modal “Survival Pie” approach to living a healthy life with HIV and hemophilia helped others realize that they, too, can potentially extend and enlarge their own lives no matter their circumstances. “In September of 2014, I was attending my first National Hemophilia Foundation Annual Meeting. I was a new Executive Director of a brand new NHF Chapter in West Virginia. I walked into a breakfast session one morning and ended up walking into one of the most inspirational speaking sessions I have ever attended. Of course, I had to meet this speaker and walked into one of Vaughn Ripley’s patented hugs. You see, he’d been keeping an eye on West Virginia, since we were right next door to him. He was ecstatic that we finally had a chapter to call our own. So the man graciously (foolishly) offered to help us with anything we needed to help our chapter get going. A few months later, I asked Vaughn to make good on his offer. WVNHF held our First Annual Men’s Day Event in April of this year and Vaughn was pivotal to its success. Vaughn traveled across the state with us to meet with the staff of our Hemophilia Treatment Centers to promote the event. He did radio interviews to encourage participation. He helped with planning and coordination. The day of the event Vaughn, filled roles as co-host, featured presenter, as well as panel member. I can’t begin to describe his unflagging energy and passionate spirit on behalf of our chapter. He became a mentor and motivator to many that day.